What stuff cost in ancient Rome. Wow. I'm liking making our screener DVD's from HD masters rather than SD files. I don't know why -- the compression to Mpeg2 is a lot less sukkity from the HD masters. The stereo mix is vastly more even with the center track +3dB. Center goes to right and left of the stereo track. Left front and left surround both go to the left side, right front and right surround both go to the right side. 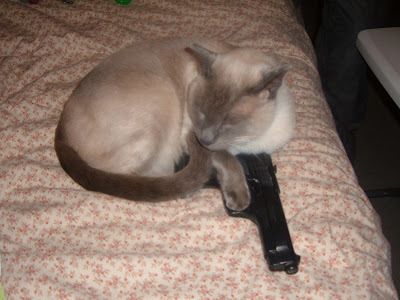 How many pictures of cats with guns are there on the Internet? Oh God. I think I just invoked Rule 34. You know what? I don't want to know. I'm looking at an old script I wrote in 2003. If we did this movie it would be our 3rd prison-planet picture in a row.